I am always interested in trying new products. When I was in a gourmet kitchen store recently I saw Malt Syrup which is made from Barley extract. I used it in this recipe but you could easily substitute honey as well. 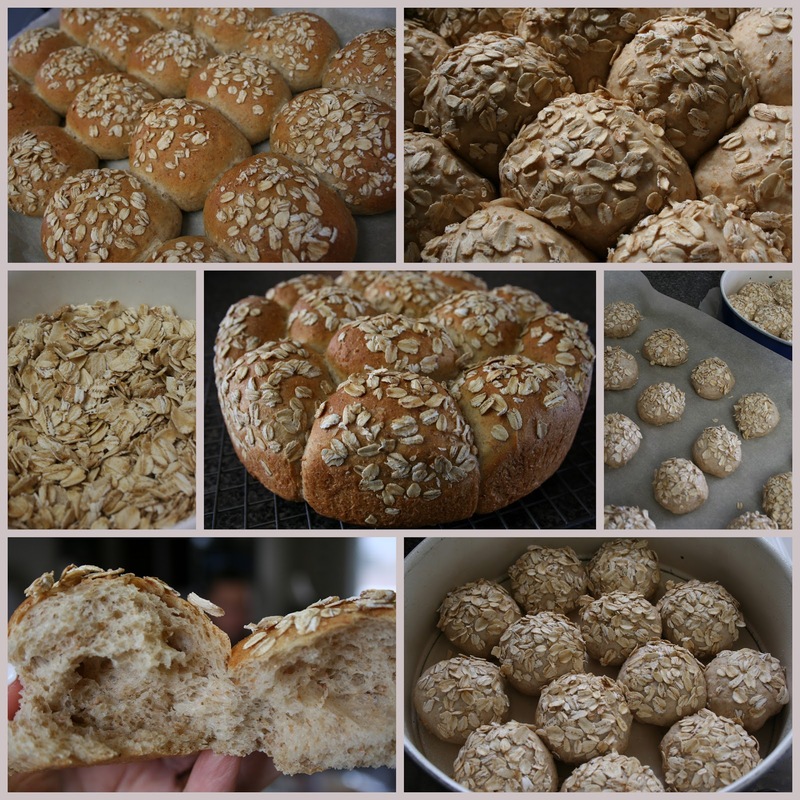 The buns can be put close together in a springform pan for a table presentation or can be baked on a cookie sheet. The result is a nice soft good for you bun. Combine the wet ingredients and the salt in a large mixing bowl. 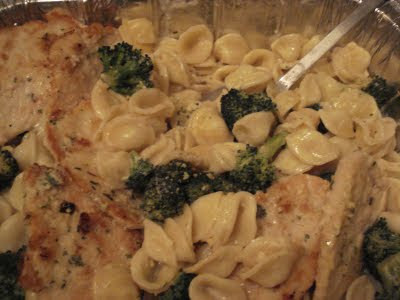 Sprinkle the yeast over the wet ingredients and stir and then allow to rest 10 minutes. Add the whole wheat flour and the oatmeal and stir well. Add enough additional white flour to make a soft dough. Knead a few minutes and then allow to rest 10 minutes. Knead another 5 minutes and then cover the bowl and let rise until doubled in bulk. .about an hour. Form into small egg sized buns and dip the smooth tops in water and then press into oatmeal. Allow rising until doubled in bulk. Put a loaf pan in the bottom rack of the oven and pour boiling water up to a half inch from the top. On the rack directly above the loaf pan with boiling water bake the buns for 15 minutes or until golden brown. Remove loaf pan from oven once your oven has cooled completely to avoid scalds. This post is especially for young moms. do the very best I could in raising my children. Today I'd like us to think of life as the threads of fabric, knit, sewn, and woven together. Just as there are many materials to choose from when making blankets and garments, you want to choose wisely the teaching and influences that will be woven into your children's lives so that they become durable and attractive, rather than frayed and tattered. Your workmanship is marvelous. You saw me before I was born and scheduled each day of my life before I began to breathe. Every day was recorded in Your Book". As you are on this journey of motherhood I want to encourage you to carefully and prayerfully clothe your children spiritually and emotionally with the right fabrics. I've chosen a few that may help you. Choose durable fabric - woven in truth. The only place to find tough, resilient fabric is in God's word, which endures forever...because it is truth. As you teach the word of God to your children they will have truth woven durability that will help them withstand the deceptions of the world. Choose tightly knit fabrics - sewn in confidence. Children often struggle with self image and belonging. Teach them who they are in Christ. Remind them that they are children of The King. Choose stain resistant fabric - treated against temptation. We want our children to put on warm jackets to protect them from the cold and possibility of getting sick. In the same way properly clothe them spiritually. The more you get to know your children you will know and understand their weaknesses. Out of love you will want to provide extra stain resistance through scripture, accountability and guidance, helping them to keep spotless before the Lord. Choose fabrics that are boldly conspicuous - coloured in Christ. As your children grow they may want to blend into this world, but keep teaching them to be clothed in the vibrant colours of Christ that set them apart, shining a light for Jesus, and loving those around them. Choose fabrics that are 100% natural fibres - the 'YOU' God made. Natural fibres breathe better and are comfortable. Kids need to learn the benefits of spiritually being 100% natural. Special and unique, woven with God given gifts, talents, and personality traits that make your children unique. A woven pattern that is all their own. God has a special plan for each of their lives. The pattern, texture, feel and look of their lives will daily be a creation in the making. The things of this world can so easily weave their way into each of our lives, causing our lives to become soiled and tattered. You can't shield your children from all of them, but God can and wants to help you raise your children. Today I am praying for each of you young mom's who have stopped by MGCC. May you be encouraged in your important role as mom to your children. Someone once told me "you only have one chance at raising your children". That statement encouraged me to do my very best.....may it also encourage you to do yours. My daughter served this dip for us at our Easter family meal. The next time you serve chili to your family, save that last cupful and freeze it for this dip. Your guests will be impressed! 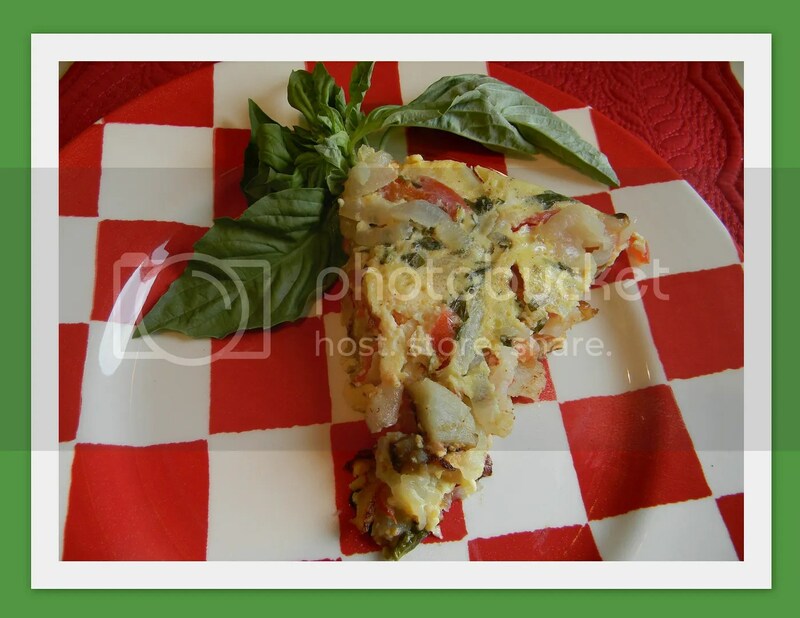 Find a shallow ovenproof casserole or glass pie plate about 8 or 9 inches in diameter. 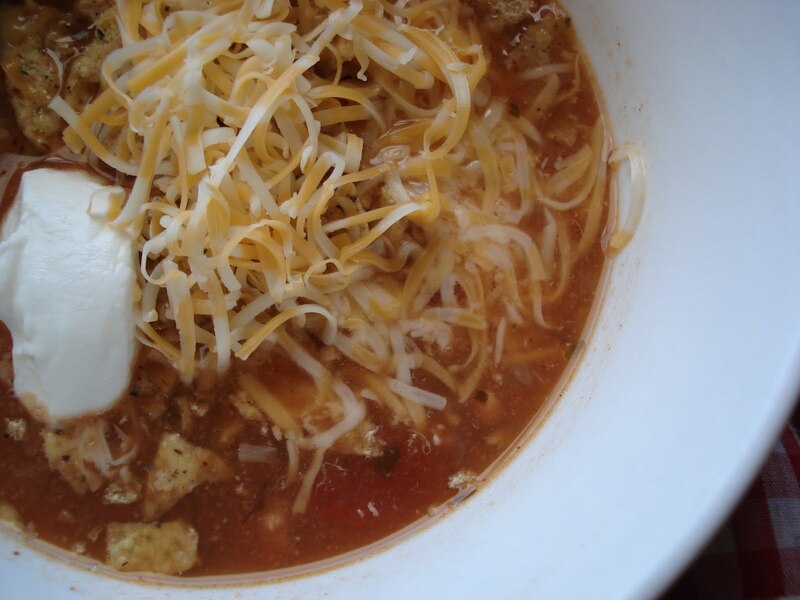 Cover the cream cheese with 1 - 2 cups of leftover chili. Grate cheddar cheese generously over the top. Bake in 350 degrees oven for about 20 minutes or until it begins to bubble around the edges. Serve with tortilla chips and watch it disappear! 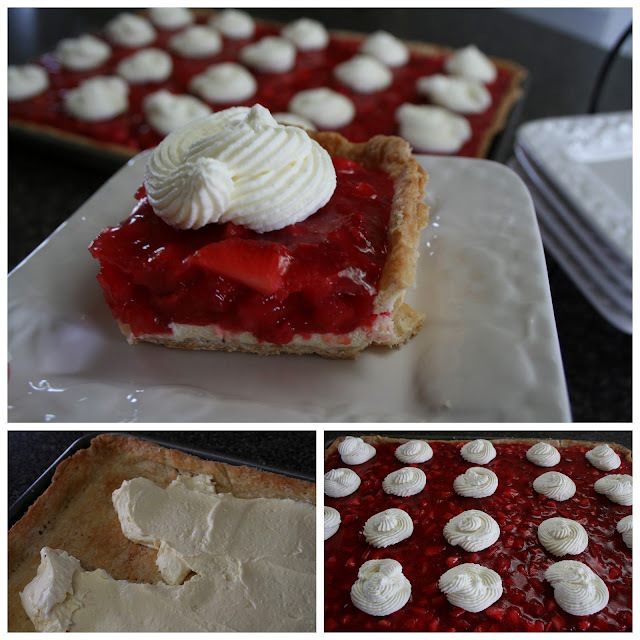 Strawberry season is right around the corner so I thought I would share another dessert that serves 20 good sized pieces or up to 30 smaller ones. 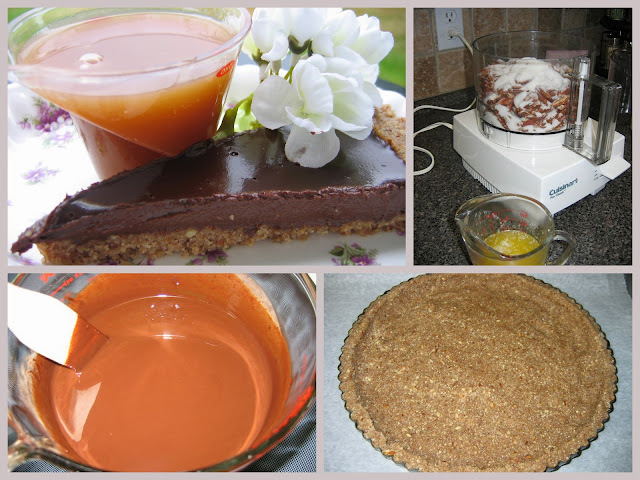 Make the pastry for the crust a day ahead and you will have half the work finished for the day of your party. You'll only need half of the pastry. .the other half can be wrapped in two separate discs and frozen for double pie or two single pies. Put the dry ingredients in a very large bowl. Stir it up with a pastry blender to evenly spread the ingredients through the flour. Cube the lard and cut it into the flour mixture until it is the size of oatmeal. Drizzle the water/egg/vinegar mixture over all the dry ingredients and stir with a fork until a shaggy dough forms. Dump it onto a pastry mat and pull together to form a large ball. Don't over mix. Divide the pastry in half. Divide half into two parts so that you will have three pieces all together. Wrap the three pieces separately in plastic wrap. Chill. For this dessert, take the large piece of pastry and roll it onto a floured pastry mat or well floured counter large enough to come up the sides of a 13 X 18 X 1" cookie sheet. Roll the pastry up onto your rolling pin and transfer to the cookie sheet. Trim the edges along the top of the cookie sheet. Prick the dough with a fork every couple of inches and line the pastry with foil, pressing firmly onto the pastry, covering it all. ..extra does not need to be trimmed. Bake 10 minutes and then remove the foil and bake until evenly browned. Do not underbake ..you want the pastry nice and crisp. Cool for an hour before adding the first layer. Beat the softened cream cheese together with the remaining ingredients and carefully spread evenly over the cooled pastry crust. Combine the sugar, and cornstarch in a large pot and stir to blend the cornstarch with the sugar. Add the water and bring to a boil, stirring the whole time. Add the package of gelatin and stir. Add the diced strawberries to the pot and allow to cool for to room temperature. Spoon the filling over the cream cheese layer and chill. Beat 2 cups whipping cream, 1/2 cup sugar and several packages of whipping cream stabilizer or several tablespoons of vanilla instant pudding. Using a pastry bag with a large star tip decorate and then slice and serve. I make stuffed peppers very much like cabbage rolls, same meat filling and sauce. The sauce is one my mom always made. She never used tomato soup in any of her recipes, but I'm sure you could use it in this recipe if you have those around your table who do not care for the chopped onions and pepper in the sauce. Cook about 1/3 cup rice in 2/3 cup water and 1/2 teaspoon salt, until done. Spray medium sized roaster with cooking spray. Prepare peppers. If peppers are large, simply cut in half and remove stems and seeds. Shave off the pointed/top part so that they sit better. If using small peppers, cut the pointed section off, remove seeds and stem. Arrange in roaster, flat sides down. In a large bowl, mix ground beef, seasoning, onion, sour cream and cooked rice. This works best by hand. In large skillet, cook chopped onion and pepper until soft. Add half of the broth. Mix flour and the rest of the broth in a sealed jar and add to sauce. Stir in tomato paste, salt and pepper to taste. Stir sauce until it comes to a boil and thickens. The question came up a while back, if we could share some recipes or ideas for bringing meals to others. Years ago, in my home church, I started a group called "Caring through Sharing", that basically meant that I co-ordinated the meals when a situation came about that someone in our church family or community was in need of meals. Either recovering from having a baby, surgery or illness, or when there was a death or crisis. Recently I heard someone say, "please don't bring Chili or Lasagna, we have enough of that to eat for 6 months". As delicious as those meals are and very convenient to bring, there are more ideas available and we would just like to share a few with you. We would love to hear anything that you have experienced in either giving or receiving meals that you would like to share with us that you found worked out well. Leave a comment, we would love to learn more. When I had my babies, I was the happy recipient of some wonderful meals and I remember them fondly still. It is a good feeling to be genuinely cared for by others, and have enjoyed paying it forward. It really is a little effort that goes a long way. First off, if the people receiving the meal are part of a larger community, then it is easier if one person is in charge of organizing meals. Then the one receiving the meal is not answering the same questions over and over again, and there are times that it is important to not overwhelm people with kindness. They may really need their space for either recovery from having a baby an illness or in a crisis situation, so having one contact person makes things easier on everyone.Always asks about likes, strong dislikes, allergies or food intolerance. If you make a meal with a sauce, always make at least 1 1/2 or double the recipe for the sauce, because it tends to be absorbed by the rice or pasta and when heating it up either later when it has been frozen or even a day or so after receiving it can be dry. Make sure that you bring meals in containers that you don't need back, that they can either recycle or reuse as they pay it forward for someone else some time. A good idea is to use foil containers for the hot dishes, zipped plastic bags for salads and veggies. 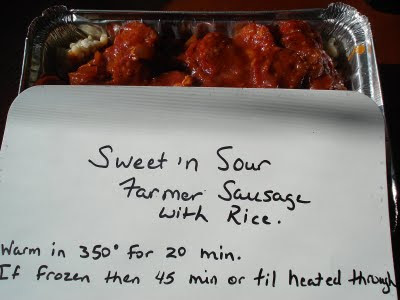 Label everything with a date,what it is, ingredient list if needed and for the main dishes add instructions if you bring it frozen how to reheat and for how long. If the person is able to go out, think about inviting them over. It might be just the thing they need to help in their recovery. I have a friend that had a serious eye surgery. She felt well, just was not able to work in the kitchen, and just loved being invited out, and a little goodie bag with left overs was sent home along with her was always appreciated. One of our commenters, Linda made a great suggestion. Have a meal with someone who is a shut in and lonely. That is such a meaningful suggestion and would mean so much to someone who eats alone. Everything tastes better shared in good company! Be creative, do as you feel led, and remember what you do for others, you really do for HIM. Keep in mind who you are bringing meals too. Often it is helpful if you are bringing meals to a family with school aged children, that you include snacks like muffins, cookies, or homemade granola bars, pizza buns, or meat buns.......all the recipes you can find on our blog. Older adults appreciate lighter meals, like soup, buns, salads, or smaller casseroles. Include a card of encouragement. It is so good to know that people actually do care. Also, I do want to share with you one very important fact. The meals do not have to always be homemade. If you have a time restraint or are not comfortable to cook something for someone else, there are wonderful meals that can be purchased either at a super market or restaurant. The whole purpose of sharing a meal is to bless someone else. Cut the sausage into coins, and brown in a bit of oil along with the onion. Lower the temperature to a simmer for a half hour. You get the idea, right. Today, Canada is celebrating Queen Victoria's birthday, May 24th. She is known for the longest ruling monarch of Great Britain, May 24, 1819 - January 22, 1901. It marks the first official long weekend in spring, which is popular for spring/summer travel and also a wonderful time to start gardening plans. Harvesting fresh rhubarb from my garden is one of my favorites. It seems like it can grow anywhere without too much care....except at my place. Last year my daughter planted a couple of plants behind the shed and somehow they disappeared only because her Dad thought that they were weeds and dumped a load of topsoil on the newly planted patch. Regardless, I will endeavor to make it up to her by planting some more rhubarb. One thing about rhubarb, you either love it or you don't...but this one will fool you. Cream the butter, cheese, icing sugar, and milk. Roll out and fit into a 9-inch springform pan or put into a 9x9 baking pan. Gradually add the icing sugar and beat until smooth. It should be a thicker consistency. Spread the icing on the crust when it is cool. Cook rhubarb in water and sugar. When rhubarb is completely cooked and no longer hold its shape, remove from heat. Gently fold the rhubarb into the whipped cream until completely blended. Top the shortbread crust with the rhubarb mixture and chill before serving. Enjoy this light airy surprise of rhubarb! Am I a nurse or a hotel guest? A few week ago we were challenged at church about our attitude in our life here on earth. The speaker asked us to evaluate whether our day to day attitude was of a hotel guest or a nurse at a hospital? This is a relevant challenge to me at this time because we have been traveling and staying in hotels and it's that time of year for my yearly check ups and procedures where I see nurses at work to make things comfortable for me and serve my needs. A hotel guest wants everything provided for them. Clean room, fresh linens, fresh towels, the bed made and then they want the hotel to provide any other luxuries available. They are very disappointed when they don't get everything they expected. A Nurse looks to the needs of others. A nurse provides what the patient needs. Sometimes the nurse has to change bed pans. A nurse does what the doctor orders. I've been challenged to consider where my attitude is. Is my day to day attitude one of a demanding hotel guest or a resident nurse in this world? 12When he had washed their feet and put on his outer garments and resumed his place, he said to them, "Do you understand what I have done to you? 13 You call me Teacher and Lord, and you are right, for so I am. 14If I then, your Lord and Teacher, have washed your feet, you also ought to wash one another’s feet. 15For I have given you an example, that you also should do just as I have done to you. 16Truly, truly, I say to you, a servant is not greater than his master, nor is a messenger greater than the one who sent him. 17If you know these things, blessed are you if you do them. Sunshine and very warm temperatures...that is the outlook for today! 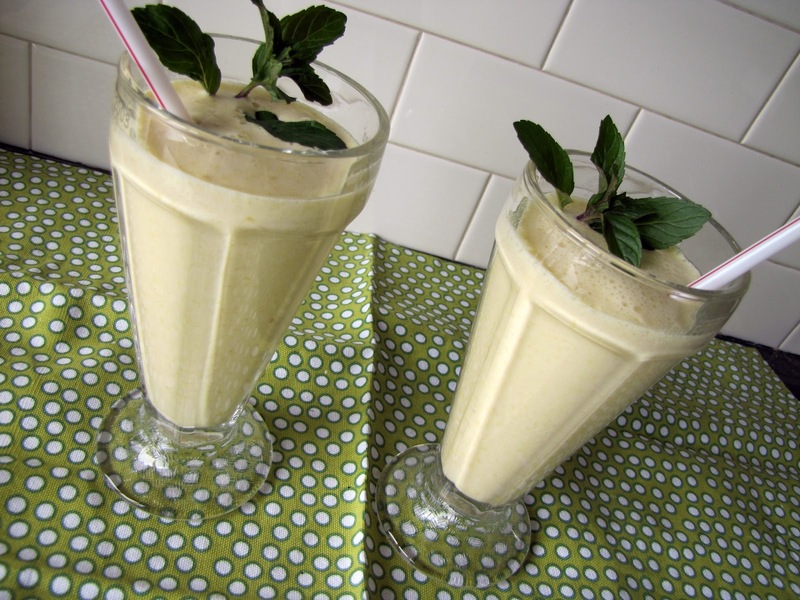 What could be better than a mango milkshake on the front porch? And the mangoes are almost a steal at our local grocery store this week. We took a liking to mango milkshakes when we were in Kenya earlier this year. Now we are enjoying them at home. Place all ingredients in a blender...and blend until smooth. I'm sure you can all remember moments of inspiration that you've had. My moment of inspiration for the apron came when I was pondering what our cookbook might look like. I don't think it was an intentional idea to give the book a retro feel and yet since many of our memories of the heritage foods date back to the 50's and 60's. . . I naturally was drawn to the vintage linens and kitchen items that belonged to my mom and now to me. We knew that we would have professional group photos done for the book and rather than us all agree on a color scheme or even making a decision whether to dress up or down. . .it seemed easier to come up with a "uniform" that would be part gift .. .
and partly a signature look that would be ours. We did not know when the aprons were started that we would be wearing them for our cooking classes. It is so fun to have a reason besides the book photos to need an apron. In early June of last year I began to search out fabrics that would work well together. 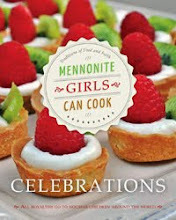 I wanted them to be bright and cheery and remind us each of the aprons our mothers sewed up for themselves and wore daily over their clothes to keep their ironing down to a daily apron instead of ironing a new blouse or dress each day. Once I selected the fabrics. .I found coordinating trim and dipped into my mom's vintage trim collection that I inherited when she passed away. The girls with the green rick rack have trim that is at least fifty years old. I found some blue and red seam binding in her collection as well as a bit of white seam binding when I realized I was running out of the meters I purchased. Being a very sentimental person. .
We had no idea that so many of you would ask us for an apron. The publisher has received countless emails and judging by your kind comments and emails as well . ..it was tempting for a very short while to see about producing them and selling them to make additional money for charity. We quickly realized it would just not be cost effective. We would have to come up with our own pattern, since we would not be allowed to produce aprons to sell from the commercial pattern. The cost of the fabric and then the labour involved would not make it very affordable for you to buy. So ..we are offering you the pattern number and we hope that those of you that can sew. . .will team together with those that can't. Perhaps the non sewers can offer to buy fabric for the sewers and you can work out a win win situation. We are of course so delighted you are enjoying the photo's in the book. Your response has been delightfully overwhelming. 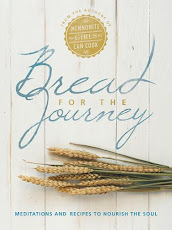 We are so grateful to each of you that has left comments about our book. We are posting many of them on the book page. If you haven't already purchased your book and haven't been able to find it in a bookstore near you. . . please be patient. You might want to visit our book page for additional information and book reviews. I will keep the apron number posted there as well. In the meantime ...we are still getting the word out there about the book. Every week requests are coming in for radio and article interviews and if you ask your local bookstores to bring the book in. . .we hope that eventually it will be widely available. We are very pleased to have the book available through the publisher and most other popular online sources. Thank you so much for making the book an instant success. 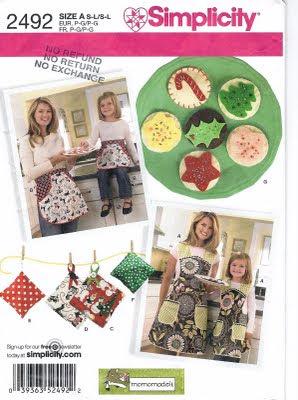 The link to the apron pattern is here . There is a little more about how they flapped in the breeze for the photo on my What Matters Most Blog. These cookies are reminiscent of Betty’s Whoopie Pies however they use milk instead of sour cream and have a marshmallow filling. They freeze really well and are delicious when eaten right from the freezer! Treats for those little monkeys in your life. 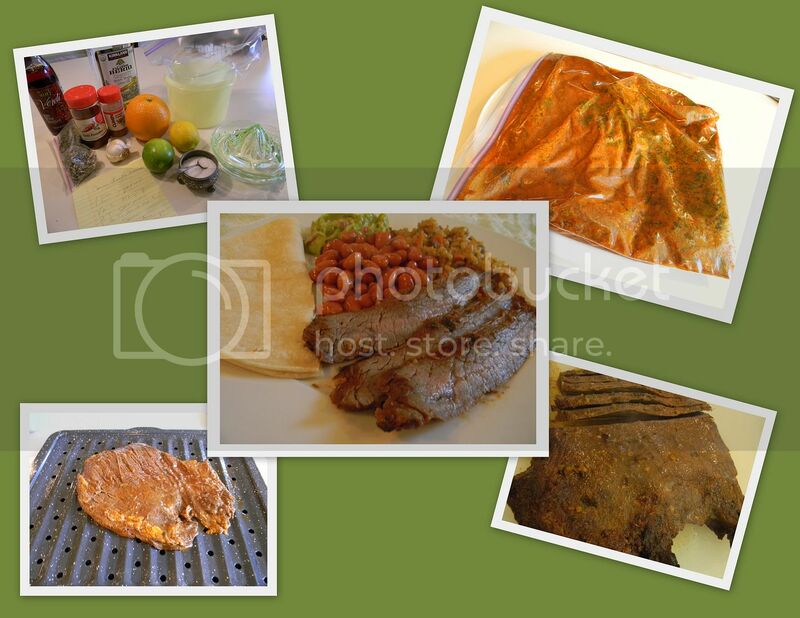 Line cookie sheets with parchment paper or grease. In mixer bowl, beat together, margarine, sugar vanilla and eggs. Beat until light. Add dry ingredients and mix well. This is a soft dough, more like a thick cake batter. Using a scoop or teaspoon, drop dough about 2 inches apart onto prepared cookie sheets. Bake at 375 degrees for 7 - 9 minutes, baking until cookies are soft but spring back when touched. Wait a minute or two before removing from cookie sheets to a rack. Cool completely. Fill with marshmallow filling and store in tightly covered containers in your freezer. Place mini marshmallows and 3 tablespoons of milk in a microwave bowl or saucepan. Gently melt, over medium heat - stirring frequently. Just before marshmallows have melted completely, remove from heat and stir until all the lumps are gone. Set aside. In mixing bowl, beat together margarine, shortening and vanilla. Add icing sugar and 3 tablespoons milk, beating well. Add marshmallow mixture and continue to beat. You may need a bit more icing sugar or milk to make it of spreading consistency. It should be thick but still spreadable. Offer them to your little monkeys - and their parents! 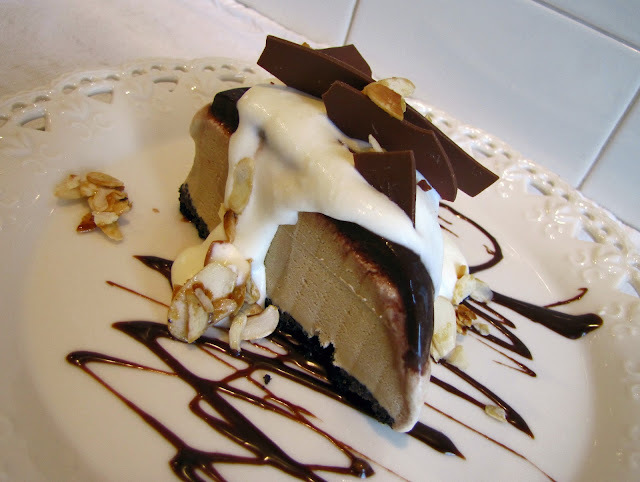 With a chocolate crust and coffee ice-cream filling, topped with rich chocolate sauce, whipped cream and toasted almonds...this dessert is a wonderful summertime treat! Combine chocolate wafer crumbs and melted butter. Press into bottom of a 9" spring form pan. Spoon ice-cream onto crust (or cut into slices to fit). Level with spatula. Freeze. For chocolate sauce, combine all ingredients in a saucepan. Heat and stir over medium heat until boiling. Remove from heat and cool until lukewarm, then spread over ice-cream layer. Return to freezer. Whip cream, sugar and vanilla until stiff. To serve, top each slice with whipped cream, shaved chocolate and sliced almonds. Note: In our area Safeway stores carry wonderful coffee ice-cream with the Lucerne label. Now that the book is out and being read near and far, the questions are beginning to be asked. At our book launch party at House of James we entertained questions from the crowd of about the making of the book and our blog. Someone wanted to know what our biggest challenge was. 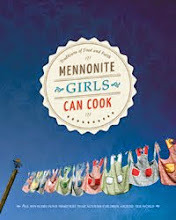 Essentially ...how could ten women agree on how to do a cookbook? As the spokesperson for this group of girls I had to really think about what our biggest challenge really was. Was it picking the recipes? Who's bun recipe should we include or who's borscht recipe would be included? Was our challenge being in harmony one with another? Did we squabble behind the scenes? Was there an underlying note of discontent that we kept out of the public arena? I can say with a smile and a thankful heart that we were blessed by the Lord with unity. He alone began this work among us and he alone knew from the first post that we would have opportunities to share something worthwhile with our readers and then also with those that are needy. It was God who gave us a spirit of unity and he gave each girl a heart of graciousness. It is not that I led so perfectly and at times I did need to ask them to bear with my weaknesses. They are a wonderful group of girls and God has given me the desire of my heart. We are ten "sisters" who stand shoulder to shoulder. We share a common passion of sharing our family recipes, encouraging hospitality and a common goal of making a difference in the lives of those who are hungry. How does this happen? 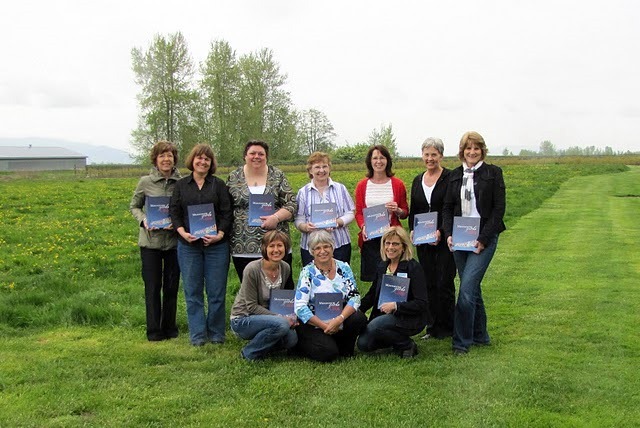 How is it possible for ten women to set aside their own individual rights with joy? Besides chatting online everyday, we are bound together by praying for one another, bearing each others burdens and also sharing each others joys. One of the most special times we had together was when we asked God's blessing on our meal at our Celebration Dinner with our husbands. Charlotte prayed in both high German and Low German. ..both languages most of us heard in our homes. Ellen then prayed in Russian . . .the mother tongue of the land our ancestors all came through. We then stood and sang the Doxology in four part harmony. It was a beautiful time of giving God praise for what He has done. God has blessed our friendship and we are so thankful that we can honestly say the biggest challenge was finding enough calendar days to be all together. These scones are soft and moist on the inside and crispy on the edges with great flavor! Your own favorite dried fruit can be substituted for the dried cranberries. Put egg and cottage cheese into measuring cup and fill with milk to measure 1 cup. Put into blender and mix until smooth. Add liquid to flour and mix together lightly. Drop by tbsp onto baking sheet . Bake for 20 minutes at 375' .. or until golden brown. I love the fun in this dessert! Who would have thought that you can put ice cream in the oven? The trick is to make sure the ice cream is totally sealed with the meringue. This is better than an ice cream cake. Preheat oven to 425° F. Grease 8 inch round pan. Line with wax paper (use bottom of pan to make template and cut out) and grease again. If you use a Springform, only grease well, you do not need to line. Beat eggs and sugar until thick and pale. Sift the flour and cocoa together and carefully fold into eggs. Pour into prepared pan and bake for 8-10 minutes, or until springy to touch. Turn out on wire rack and peel back wax paper, if using. Cool. Meanwhile, allow ice cream to soften in fridge. Beat the egg whites until soft peaks form. Gradually beat in the sugar and continue beating until thick and glossy . . . peaks form when lifting beaters. Place the cake in a pie plate to serve like pie or on a baking sheet on parchment paper, so you can transfer it to a serving plate later. Pile ice cream in a dome shape on top of cake. Spread the meringue over the ice cream, making sure it is completely enclosed. Swirl and dab with back of spoon for design. At this point, freeze the cake until just before serving. 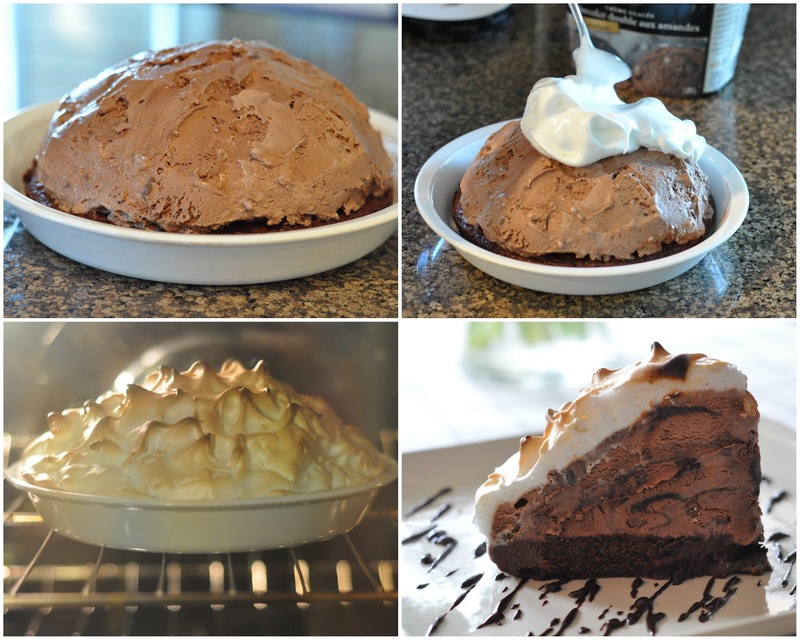 Preheat oven to 425° F again and bake frozen cake for 7 minutes, until meringue is just golden. Serve immediately. One of our favorites growing up were Kotlety. We used to call them Russian hamburgers. A recipe for a more Russian version of these is in our cookbook but I wanted to share this recipe that has a Persian twist. Put first 9 ingredients in a bowl and mix well. Form patties with this mixture, you can choose round or oval. Saute them in butter and olive oil flipping half way through the cooking process till they are cooked through. I used panko this time instead of fine bread crumbs and I liked the result. 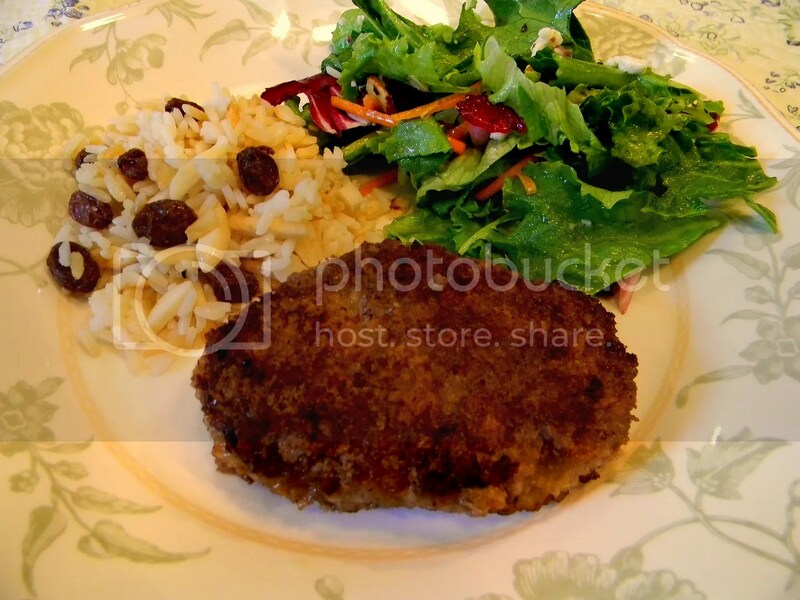 I served them with my mother’s rice and a salad but the cutlet would pair nicely with potatoes in any form. My mother always formed the patties in this oval shape. These are also great cold in a sandwich form. 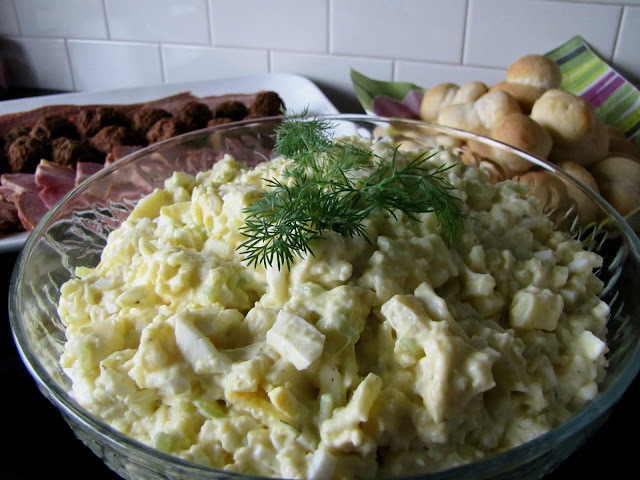 Picnic season is upon us...and what's a picnic without a potato salad? The crowd-size version of this salad is a recipe we used often at church functions in years gone by...where we prepared potato salad for 300. The recipe given here serves 50...though it can easily be doubled to serve 100. If you are planning a slightly smaller picnic...I've included the recipe to serve 10. Enjoy! Combine potatoes, eggs, celery and green onions in large mixing bowl. Mix remaining ingredients together well and pour over potato mixture...stirring until combined. If you still have berries in the freezer from last summer and have a crowd to feed. ..this is a great and very tasty option for a dessert. Apples are a great addition to the berries as they add a mellow flavor to the mix. This crisp serves up almost like a fruit bar. Using some of the crumbs for a base helps to ease in serving the dessert evenly and makes a chewy base with a crispy topping. Mix together the frozen berries and apples in a large saucepan or a large microwaveable bowl. Warm the berries until they are thawed and begin to release their juices. In a mixing bowl, combine the sugar and cornstarch. Add to the berry/apple mix. Heat until the cornstarch begins to clear. Set aside. In a large bowl, combine the oatmeal, sugar, and flour. Cut the butter in with a pastry blender or use your hands until coarse crumbs form and the butter is well distributed. In a large rectangular nonstick roaster or regular roasting pan that has been sprayed with cooking spray, scatter 3 cups of the crumbs to cover the bottom. 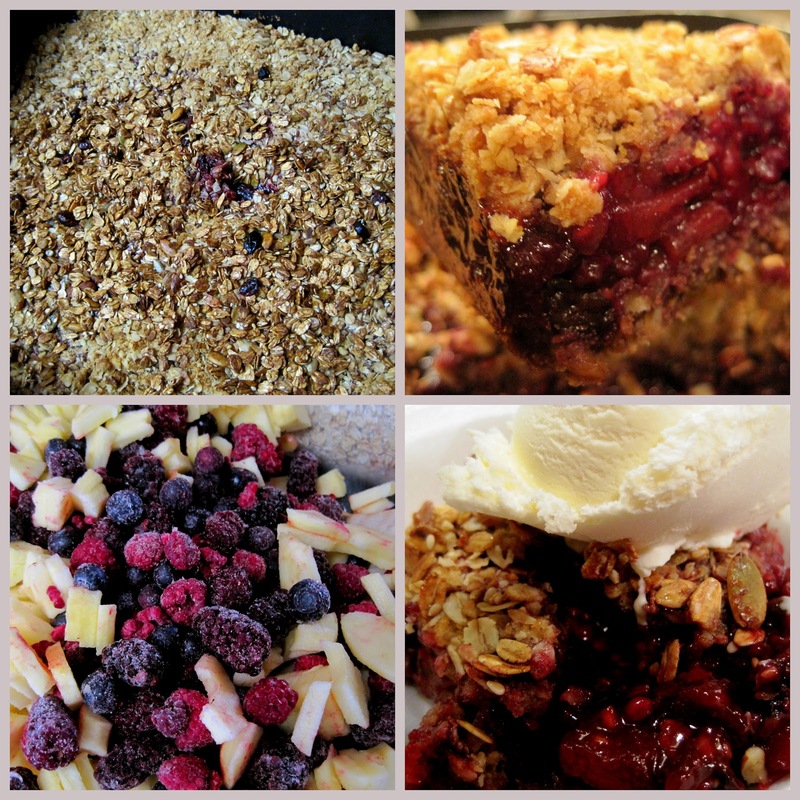 Spoon the berry/apple mixture evenly over the crumbs. Sprinkle the remaining crumbs to cover the berry mixture. Bake in a 350 oven about 1 1/2 hours. The edges should be bubbling up berries and the crumbs should we golden brown and crisp. Before declaring it done, take a small spoon from the center and dig into the berries to make sure they are bubbly and the cornstarch has cleared. Serve warm or rewarm at 300 for 15 minutes before serving. Cut into 30 pieces. Use an egg lifter to remove squares. Serve with ice cream. Refrigerate the leftovers. Since it will set once it chills you can serve the leftovers like a bar. Speaking of crowds we'd love to see you at the Book Launch Party at House of James tonight. We've been enjoying the book signing this past weekend meeting so many of you already and would love the opportunity to meet more of you. We'll sign your book and serve up some samples from the book. To see what we've been up to. ..scroll down the page to read our personal blogs. As I read about the virtuous woman in Proverbs 31, it is my mother that comes to mind. For her, beauty was not about outward appearances...but came from within. She was generous, kind and hospitable. She worked tirelessly from morning until night...with a strength that never seemed to fade. Everyone was welcome in her home...there was always room for one more at the table. She was a wonderful homemaker...and skilled with her hands. She sewed, knit and crocheted for all of us...and turned out needlepoint pictures that were works of art. She spent her life giving...with hardly a thought for herself. Even in the last few hours of her life, she reminded us that she had prepared a lot of food...we should be sure to cook the cabbage rolls and the pies that were in the freezer. Always thinking of others...always giving to us...and sometimes with hardly a word of thanks in return! She left us far too soon...and with little warning. 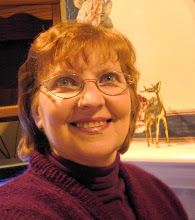 In July 2000 she was diagnosed with pancreatic cancer...and three weeks later she was gone. There have been so many moments since then that I would have loved to share with her. I wish I could thank her today for all she meant to me. If you have words of blessing for your mom...share them with her while you still can! 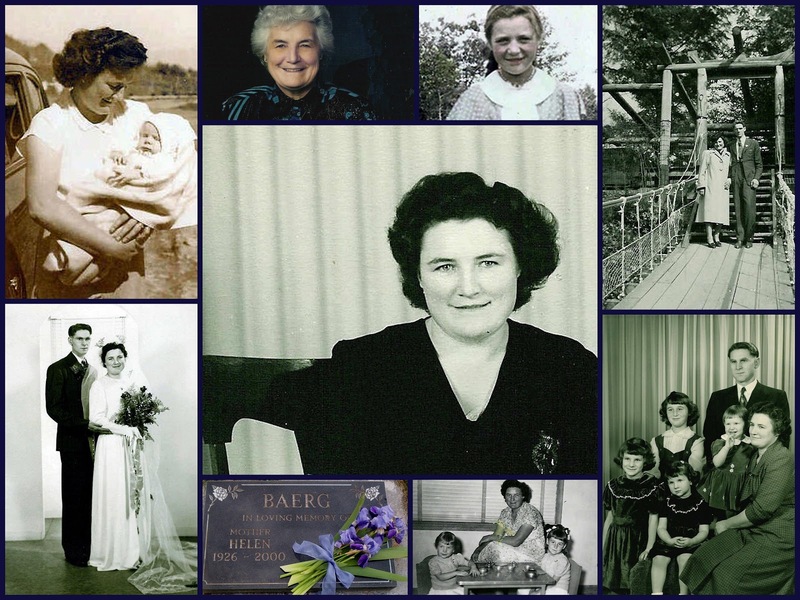 And so today we honour these ten godly women who are our mothers. We could each have written a lovely tribute to our moms-in-law today as well. How blessed we all have been to have such wonderful women in our lives! To all of you who are mothers...I wish you a very Happy Mother's Day! And be sure to 'rise up and bless' the special mothers in your life. Between Book Signings and Canucks games, one needs to keep eating. I think many of us are watching the NHL finals as we go from one series to the next always hoping for our favorite team to win. 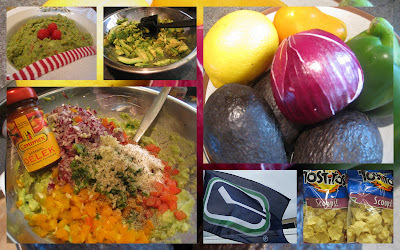 With that of course comes the question, "Who's going to host and cook for the next Canucks party?" 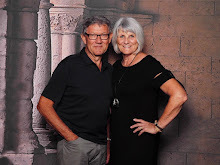 We hosted the party with unexpected guests all the way from Steinbach, Manitoba, Betty & John Reimer, another MGCC gal who drove out for the book signing events this weekend. Here's another fantastic guacamole dip that you need to add to your party menu. So let's all sit down, chomp on some good appetizers and don't forget about adding a plate of Hearty Natchos. These go really well and let's continue to cheer hard for the Canucks! They are on a winning streak. The Natcho's and guacamole dip are both variations from our famous Chef Dez. Cut, pit, and peel the avocados. Mash them in a medium bowl with the juice. Add all of the other ingredients to the bowl and mix together. Serve with your favorite pita bread or taco shells. Who would have thought that the Canucks would be on a winning streak? Who's hosting on Saturday? Today is Cinco de Mayo and I wanted to share a Mexican Recipe with you. In elementary school growing up in the Los Angeles area of Southern California we would always have a celebration at school on this day. We learned the Mexican Hat Dance and enjoyed performing it at our assembly. Cinco de Mayo is a date of importance for the Mexican and Chicano communities. It marks the victory of the Mexican Army over the French at the Battle of Puebla. Although the Mexican army was eventually defeated, the "Batalla de Puebla" came to represent a symbol of Mexican unity and patriotism. With this victory, Mexico demonstrated to the world that Mexico and all of Latin America were willing to defend themselves of any foreign intervention. Cinco de Mayo is not Mexico's Independence Day, September 16, 1810 is. Cinco de Mayo is celebrated on a much larger scale in the U.S.A. than in Mexico. A great marinade for steak! You can even use it for chicken for Pollo Asada! Use skirt steak or flap meat, but any thin cut steak would work. I used what is called Flank Steak here in the Washington State. This recipe is for up to 4 pounds of meat. Cook time does NOT include marinating time. You can use 4 pounds of chicken breast meat also. Combine all ingredients in a 1-gallon ziploc bag. Add meat, seal and massage marinade into meat. Marinate in bag for up to 24 hours, turning and massaging frequently. 4-6 hours for beef and 2-4 hours for chicken would work fine, also. Grill to medium rare for beef and of course for chicken till it’s cooked thoroughly. Serve whole, sliced, or diced for tacos or burritos! 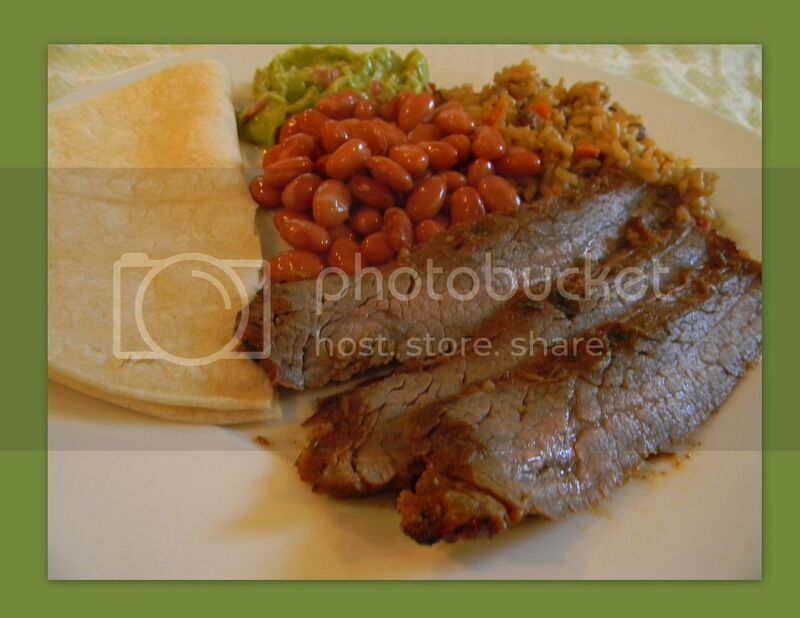 Serve with beans, rice, corn tortillas and guacamole. Because it wasn't grilling weather I cooked this under the broiler for 8 minutes on each side and it was well done. If you like meat that is medium rare adjust the cooking time. for a coffee break treat. Cream butter. Add sugar, egg, water and beat well. Add flour, oat bran, baking soda and baking powder. Beat until incorporated with butter mixture. Add rice krispies, chocolate chips and dates. Bake at 350º for 9-11 minutes. Remove to cooling rack immediately. Yields 2 dozen. Naan bread is a type of flat, leavened Indian bread. 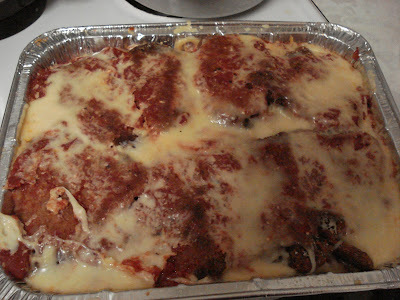 I'd like to try making it on our grill sometime, but since it's readily available in our area, I buy it ready-made and like to have it on hand, either in the freezer or fridge... to make quick individual pizzas. Top with chopped ham and/or turkey slices and cheese. Bake at 400° F about 5-10 minutes, until cheese bubbles. Friday is often soup day around here and I like serving different breads along with the soup. 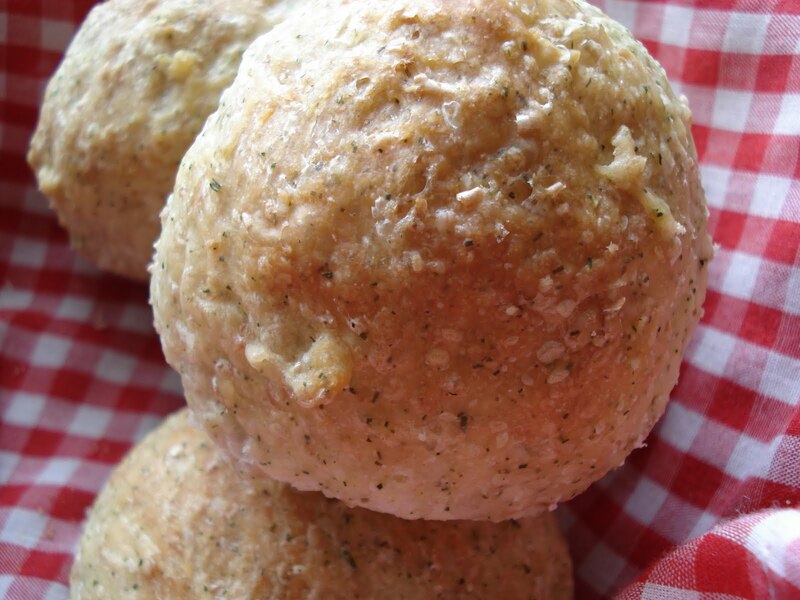 This dill and cheese bread is a nice change, if you like the flavor of dill. If you do not have a blender, don't worry. I don't think I would use a blender next time, I like to see the cheese and onions in my buns. Knead for a few minutes adding a bit of flour at a time so the dough is not to sticky, about 1/4 cup in total is what I needed. Put the dough in a greased bowl and let rise til double. Make into buns or place it all into a greased casserole dish for a loaf of bread. Again let rise until double, about an hour. Bake in a 350 degree oven for 40 minutes for the loaf and 18-20 minutes for the buns.